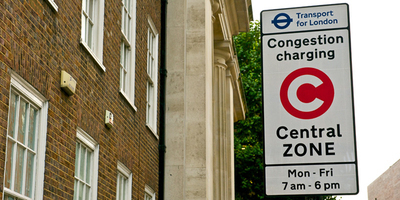 Vehicles which drive within a clearly defined zone of central London between the hours of 07:00 and 18:00, Monday to Friday, excluding weekends and public holidays have to pay an GBP 11.50 daily Congestion Charge or GBP 14.00 if the charge is paid on the first charging day after travel. The Congestion Charge can be purchased in several ways. These include, by telephone through the call centre on 0343 222 2222 (international callers +44 20 7649 9122), online at www.cclondon.com, by SMS text messaging (if registered with TfL) or by post. One can also use an automated method of payment for the Congestion Charge. This is called Congestion Charging Auto Pay (CC Auto Pay) and allows account holders to be billed automatically for days travelled each month. The daily charge is GBP 10.50. Up to five vehicles can be registered for CC Auto Pay at www.tfl.gov.uk. It costs GBP 10 per vehicle to register per year. Some individuals and vehicles are exempt from payment or can claim a discount on the charge. This online facility is to assist you in registering a vehicle with nine or more seats for the 100% discount from Congestion Charging. By selecting a language using the drop down menu, an application form will be produced in the language selected. Once completed, and the submit button selected, a PDF version will be produced in English, which should be printed, signed and forwarded to TfL Congestion Charging, PO Box 344, Darlington, DL1 9QE, United Kingdom. Please do not forget to enclose copies of the relevant supporting documentation. The Low Emission Zone (LEZ) covers most of Greater London and operates 24 hours a day, every day of the year. It was introduced in 2008 to encourage the most polluting heavy diesel vehicles in the Capital to become cleaner. A daily charge must be paid for each day the vehicle is driven within the LEZ zone and does not meet the required emissions standards. Payment can be made on Transport for London website at www.tfl.gov.uk/lez, on the phone +44 (0) 207 310 8998 or by post. Operators of affected vehicles registered outside of Great Britain including trucks, buses, coaches, large vans, minibuses and other specialized vehicles will have to register their vehicles by post or email with Transport for London (TfL) if they meet the required emissions standards in order to drive within the LEZ without paying a daily charge. For further information regarding registration and the LEZ scheme in general please use the drop down menu. You can no longer pay to use the Dartford Crossing at the barriers. Instead you need to pay Dart Charge in advance or by midnight the following day. Dartford Crossing applies between 6am and 10pm.